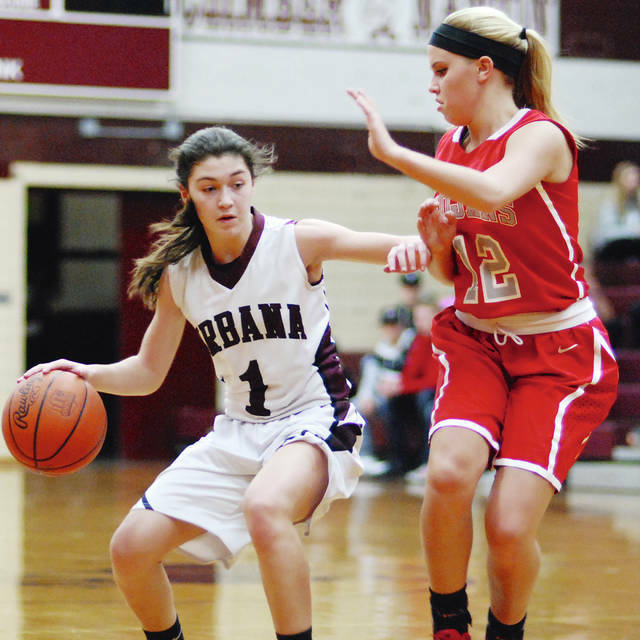 Urbana’s girls basketball team, led by guard Alaina Lyons (left) will compete in Division III for the upcoming season. COLUMBUS – New divisional assignments for the 2017-18 winter sports of basketball and wrestling were released by the Ohio High School Athletic Association. For the first time, competitive balance roster data was used in determining divisional assignments in basketball, which is the only OHSAA winter sport affected by the competitive balance regulation that OHSAA member schools adopted by referendum vote in 2014. In Champaign County, Urbana’s girls basketball team will drop from Division II to Division III. The boys will remain in Division II. Triad’s girls will drop from Division III to Division IV, while the boys were already in Division IV. All other local teams will remain unaffected, with Graham competing in Division II, West Liberty-Salem in Division III and Mechanicsburg in Division IV. The divisional breakdowns in wrestling and basketball were approved by the OHSAA Board of Directors June 1 during their June meeting. Additional divisional breakdowns for the 2017-18 winter sports of swimming and bowling will be announced in August. Division assignments are based on gender-specific enrollment numbers provided to the OHSAA by the Ohio Department of Education. Enrollment figures are then modified in the sports football, volleyball, soccer, basketball, softball and baseball based on competitive balance roster data submitted by each school. Note that new schools and merged schools are processed by the OHSAA in September after enrollment figures are final. https://www.urbanacitizen.com/wp-content/uploads/sites/36/2017/06/web1_urbanaSE1.jpgUrbana’s girls basketball team, led by guard Alaina Lyons (left) will compete in Division III for the upcoming season.